The MC-21 could replace the longtime workhorse of Russian and international airline fleets, the Tupolev-154. IRKUTSK — The formidable Su-30 fighter is a staple of the country’s arms exports, but machine tools from Germany and the Czech Republic have taken over an essential role in making them. The plant began purchasing foreign equipment in 2005 because it’s five times more productive than the old domestic stock it replaced, said Alexander Veprev, chief of the Irkutsk Aircraft Plant, which manufactures the fighter jet. The plant has so far spent $600 million on the effort to upgrade more than 200 of its turning and milling machines, Veprev said. Another $200 million is going toward acquisition of cutting-edge assembly lines from the middle of this year through mid-2014, he said. 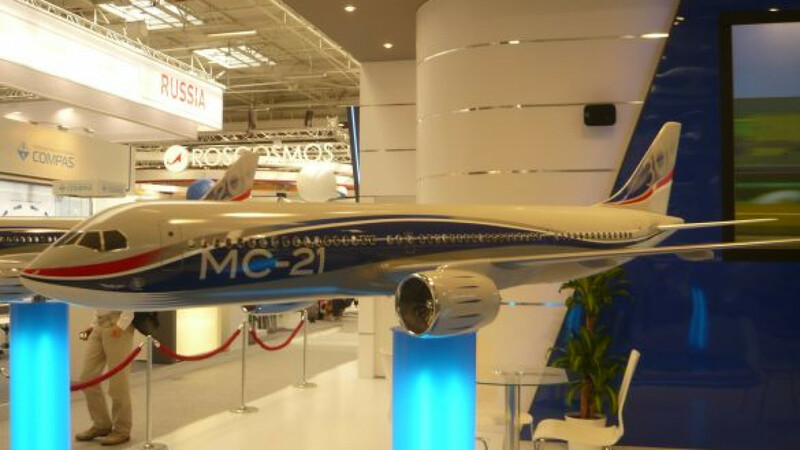 That includes plane assembly equipment ordered in Germany for the MC-21 project to produce mid-range jets to compete with Boeing and Airbus models. Durr Systems is manufacturing the equipment, which will begin operating in 2014, Veprev said. Earlier Saturday, an abridged tour of the plant was given, on which a plainclothes security officer escorted reporters. The tour revealed that the brand names of German equipment manufacturers Deckel Maho and Handtmann A-Punkt Automation as well as the Czech Republic’s Tajmac-ZPS and Tos Kurin were prominent for the time being. One Handtmann machine had a notice on the side that it cost the company 42 million rubles in 2006 (approximately $1.5 million at the time). Irkutsk Aircraft used to be a regular customer of Savyolovsky Machine Tool Plant, outside Moscow, Veprev said. Sergei Yamanov, the plant’s deputy director, led the tour of the plant, which also produces the Yak-130 military training jet, past wings and other airplane parts. At one point, he said — with a somewhat rueful undertone — that 90 percent of the machine tools there came from abroad. “Whatever remains from the Russian stuff also operates here if it still fulfills its function,” he added. The tour wrapped up at the end-product facility with two rows of Su and Yak aircraft, their glass cockpit roofs lifted open and some parts still missing. The visitors drew curious glances from the workers, perched on top of the machines, who quickly regained their concentration and went back to making adjustments. Veprev said the MC-21, while a narrow-body type, will still have enough space for a wider aisle and will therefore be more comfortable. Two standard wheel trays will be able to pass one beside another, he said. “If a flight attendant pushes that tray down the aisle, there will still be a good chance to go to the toilet,” he said. The luggage compartments will also be larger, while smaller fuel consumption and easier maintenance will reduce its operating costs by at least 12 percent compared with similar models now on the market, he said. The first commercial delivery of the MC-21 jet, which will seat 150 to 210 people, is scheduled for 2017. Pratt & Whitney has agreed to supply engines for the plane starting in February 2015, Veprev said. Later that same year, a test model of the MC-21 will take off from the tarmac, he said. If successful, the MC-21 will come onto the market after another post-Soviet passenger plane, the Superjet-100, a smaller aircraft seating up to 98 people. Irkutsk Aircraft also produces parts for the Airbus 320. The line where workers finish landing-gear compartments and keel beams is located between the sections for the wings of the SU-30 and Yak-130. When reporters were passing through the Airbus area, workers were using a solvent to prepare the parts for painting, but none was wearing a breathing mask, despite the poisonous fumes. Every month, the plant makes nine sets of landing-gear compartments and keel beams, Yamanov said. The contract with EADS, the aircraft company that makes Airbuses, has been instructive, he said. “We have gone through a good training phase while making the components for the Airbus 320,” Yamanov said. Irkut, which owns the plant, is part of United Aircraft Corp. It earned $123 million in profit on sales of $1.6 billion last year.